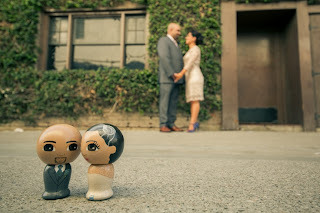 How adorable are these custom cake toppers?!? I love how they match perfectly with the bride and groom. I'm on a wedding team with their creator, Dandelionland, and she's as sweet as her creations are! You can view more of her creations in her Etsy shop here. Hope the sun is shining where you are ~ it's a rare sunny day here in the Pacific Northwest!